...AS A CHILD I LOVED TO RUN IN THE CELLAR OF MY PARENTS BETWEEN THE SCENTS OF WINE AND PLAY HIDE AND SEEK WITH MY SISTER BEHIND THE LARGE BARRELS OF MY FATHER. Then I grew up and I worked for several years in my family's firm and I travelled around the world upto decide to begin in 2003 a new adventure all mine: Col dei Venti. One big challenge, considering also the times we are experiencing ... but I'm not alone, I also have the important support of my son Ivan and my daughter Sara. I'm situated in an excellent position between the Langhe and Monferrato and I work in full compliance with environmental and nature, I love to paint and I'm also the author of all my labels. 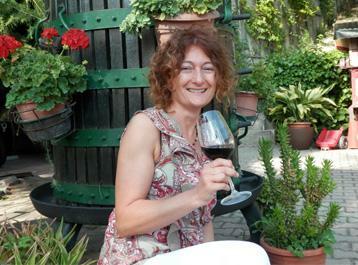 TASTING MY WINES, YOU CAN FEEL MY PASSION, ENTHUSIASM AND DEVOTION THAT I USE IN MY WORK EVERYDAY. THANKS TO EVERYONE WHO HELPED AND BELIEVED IN ME! Wine Enthusiast 90 "Aromas suggesting rose water, leather, woodland berry, forest floor, cake spice and a balsamic note lead the way. The taut palate offers juicy black cherry, tart cranberry, baking spice and chopped herb alongside firm, polished tannins. A note of star anise closes the finish.